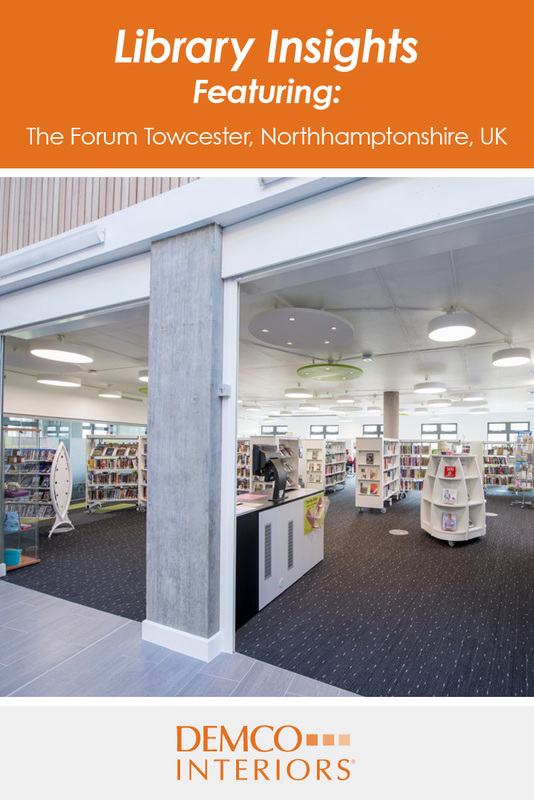 The new community building, The Forum is at the heart of Towcester, Northamptonshire is home to South Northants District Council and Northamptonshire’s County Council’s Library and Registrar (i.e., registration office for births, deaths, marriages and civil partnerships). Demco Interiors UK was the consultant for the interior design and furniture specification for the project, delivering the much desired WOW factor. A typical trend in Europe is to build multifunctional civic buildings that provide a variety of services to citizens in one convenient location. The Forum is just that — seamlessly blending administrative services, offices and a library within a 1,920 square foot building. 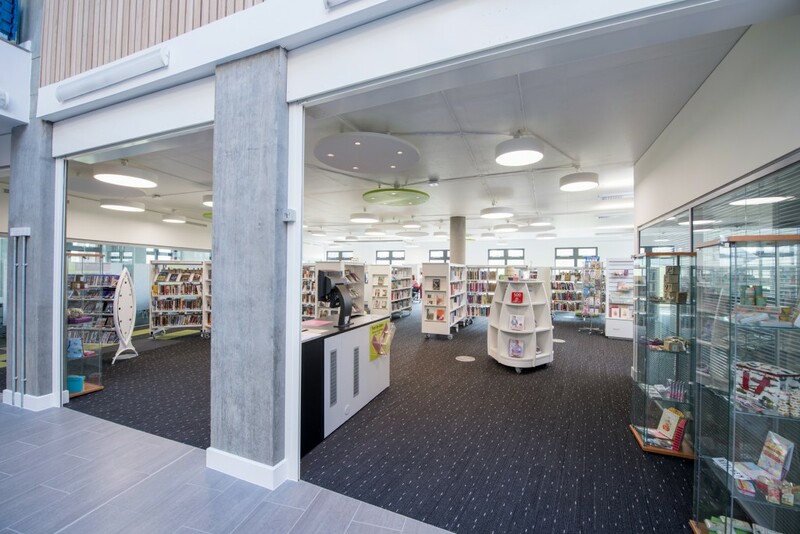 Special features include a design-led atrium and use of crossover items, such as glass display units and white book stands. 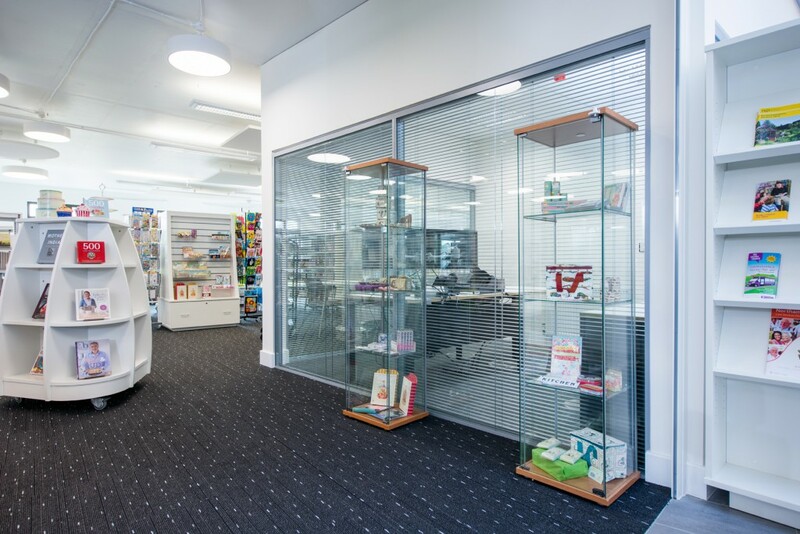 Glass display cases and white bookcases provide a consistent and neutral backdrop in this multi-purpose building. 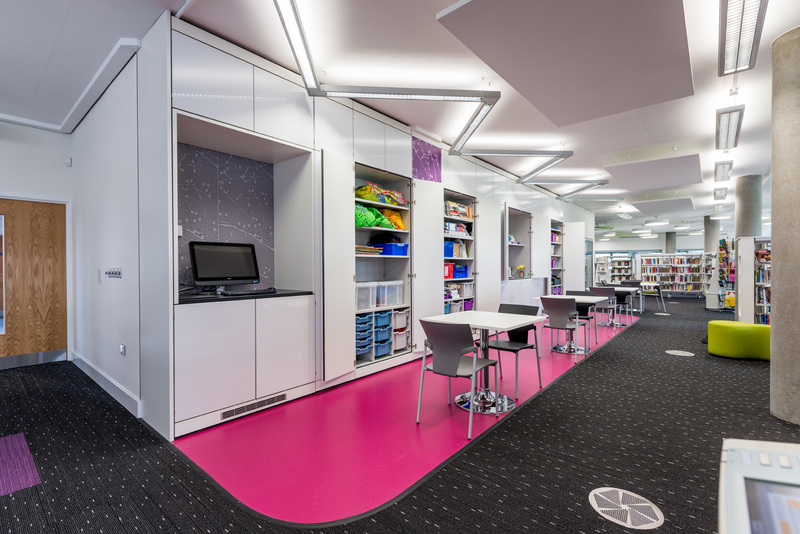 The overall library space features a crisp white backdrop and is divided into zones defined by vibrant color themes. 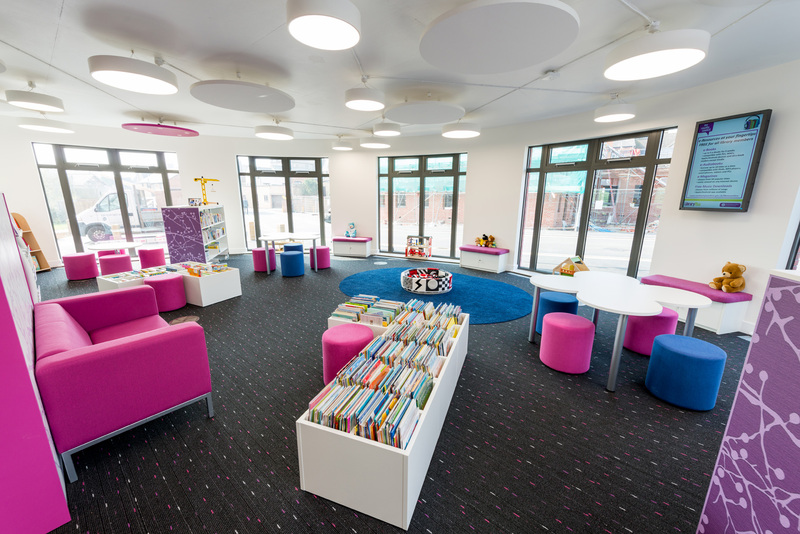 The children’s space features pops of blue and pink. 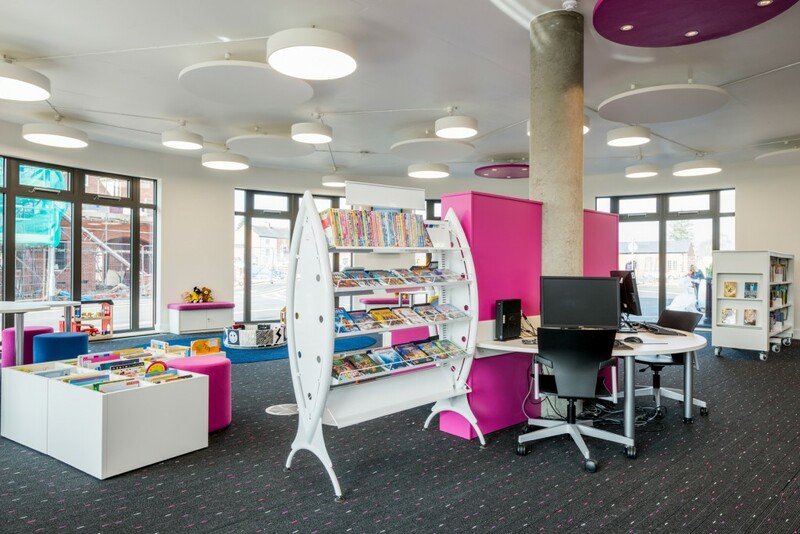 The white shelving in the children’s area is contrasted by pops of blue and pink soft seating and accents. 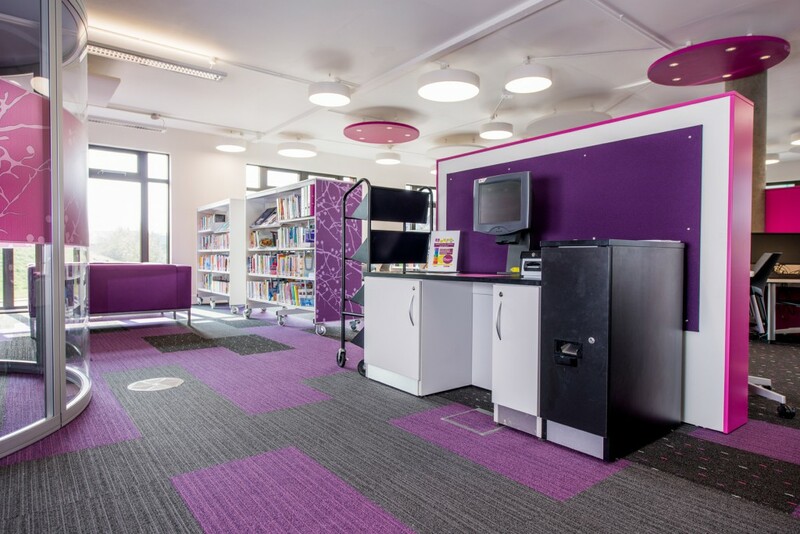 Transitioning further into the space, the adult area is defined by purples and greens. The color themes are expressed not only in the furniture but also in the flooring, lighting and other decorative elements, such a glass panels. A purple glass panel provides a vibrant backdrop for technology. 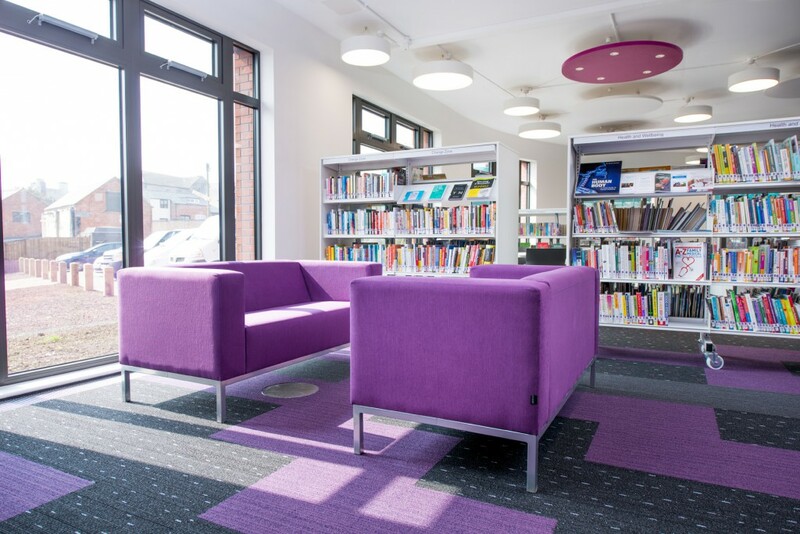 Soft seating upholstered in purple vinyl provides a comfortable space to sit between shelving stacks. Careful consideration was taken in selecting the color themes. 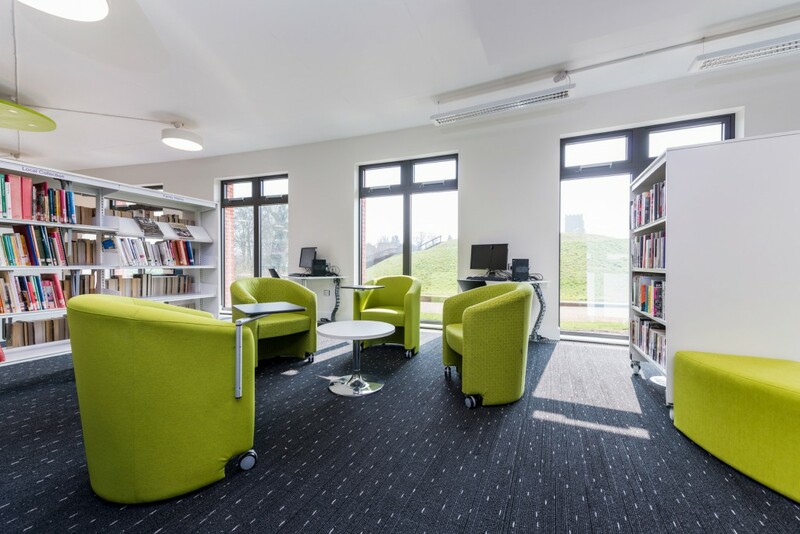 The green theme of the the adult learning rooms complements the view to the outside of trees, meadows and canals. A grouping of mobile lounge chairs offers a flexible area for collaboration. 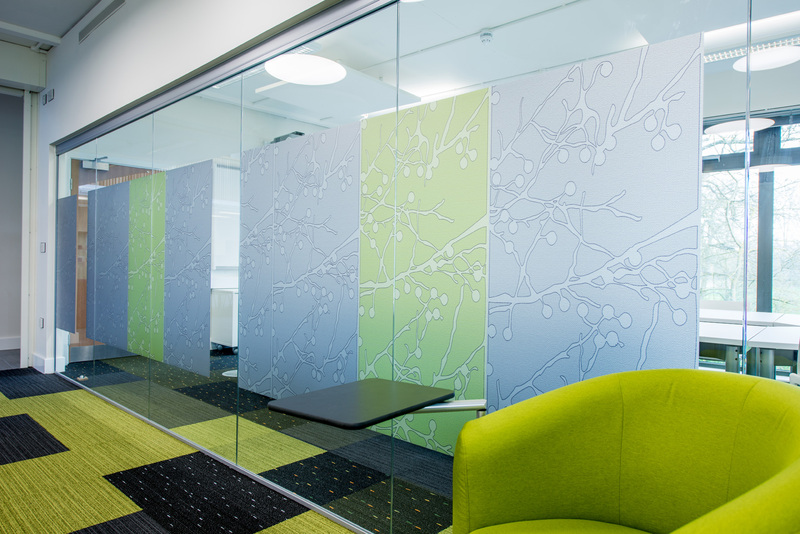 Green glass panels provide privacy in a meeting room while reinforcing the color theme of the area. 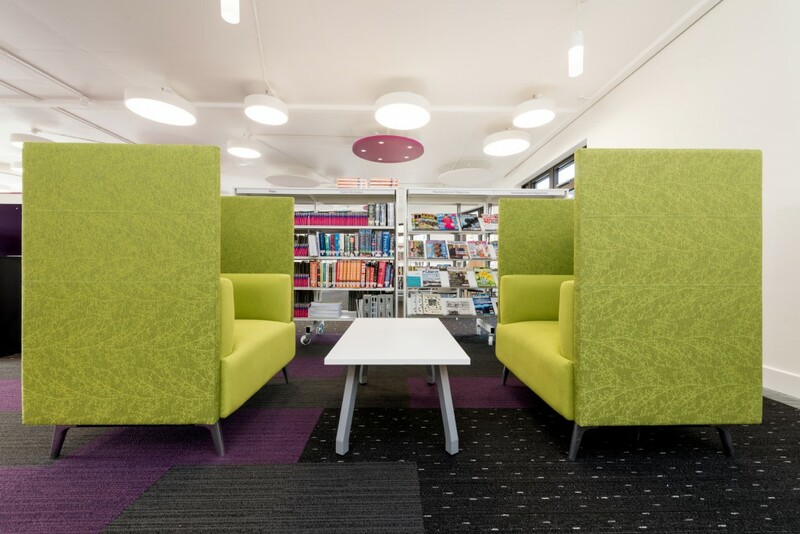 A standout feature of the library is an on-trend white wall. The stylish, white concealed storage walls, were designed and manufactured by Demco Interiors UK. The high gloss, white finish can be used as a whiteboard for displaying messages, posters, artwork, and more. The handle-free, flush magnetic doors form clean lines and a clear, clutter free surface. Beyond general storage, the cupboards of the white wall conceal a mini kitchenette. A custom storage wall offers a solution for concealing clutter. The doors of the storage wall double as a whiteboard for displaying messages. Small pockets throughout the space are used for soft seating, giving visitors opportunities to do their own ‘nesting’. 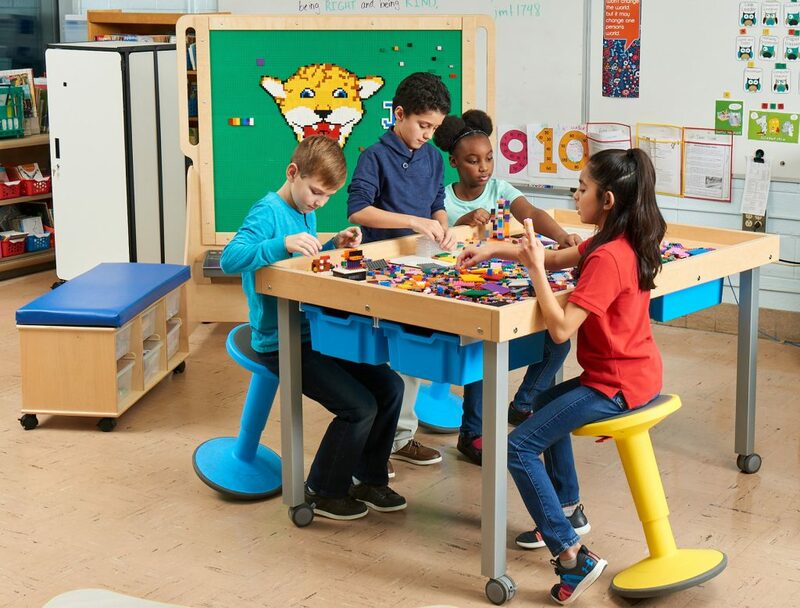 The materials used throughout the space are anti-bacterial, wipe clean vinyl, but they have the look and feel of fabric. The Forum was designed with a variety of meeting places to accommodate different sized groups. 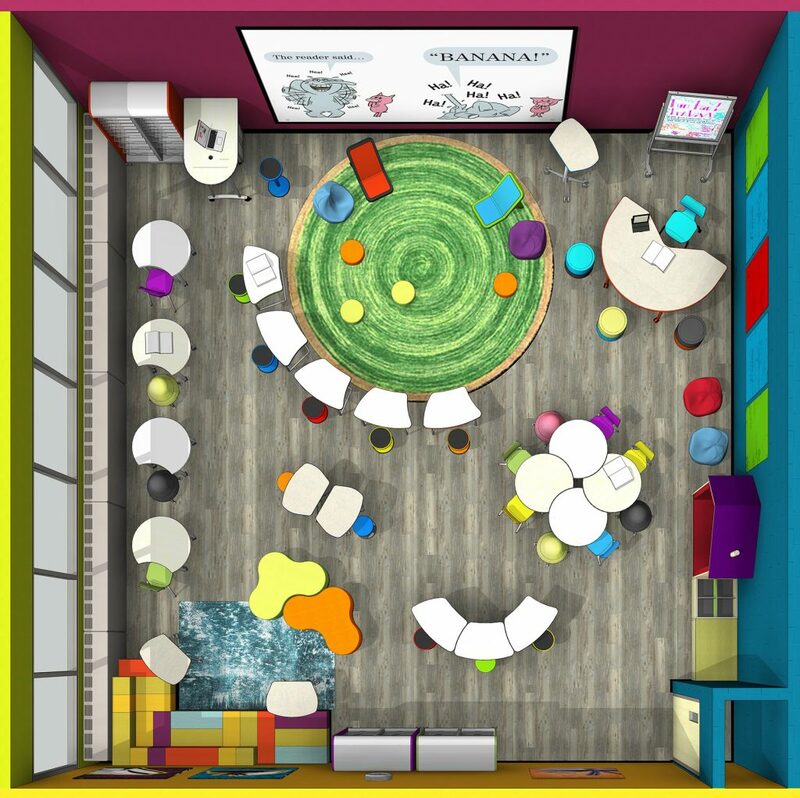 A meeting pod will be used not only for internal meetings and by the public, but can also be rented by community groups. The light and airy meeting rooms are furnished with flexible furniture to support venues for adult learning. 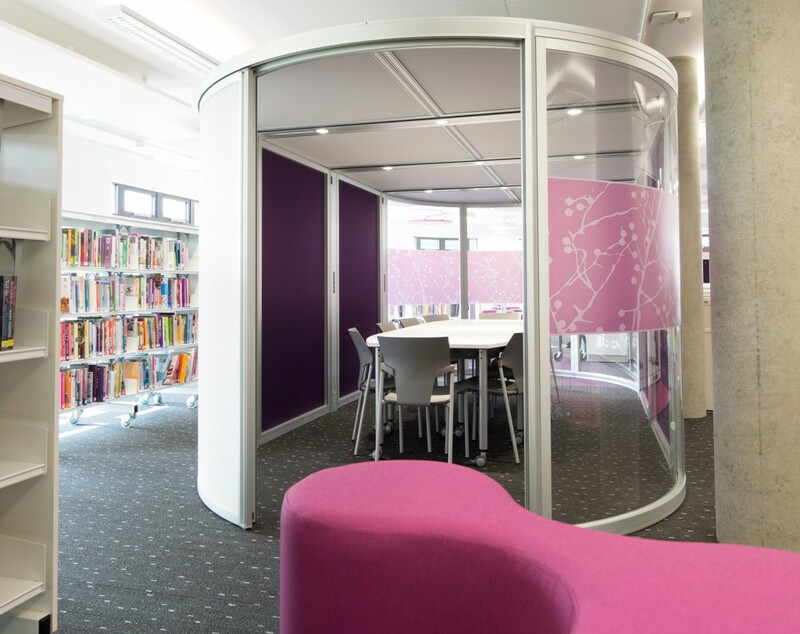 A small meeting pod is available for community groups to rent. 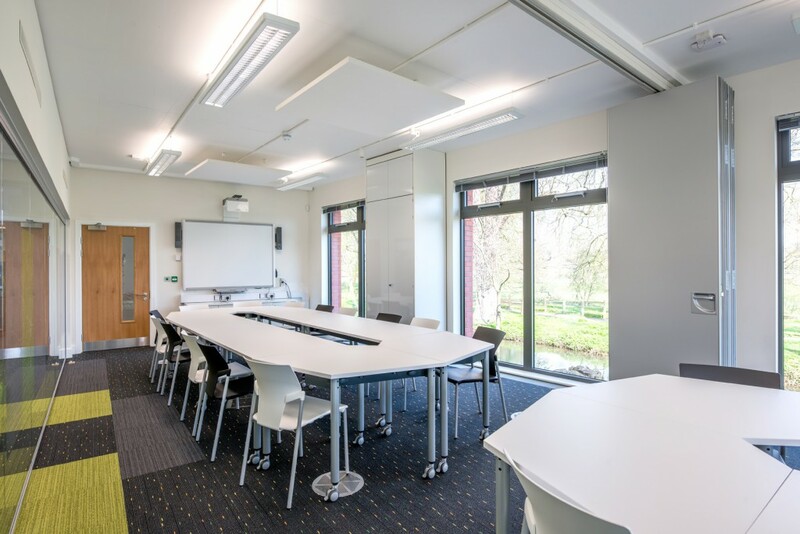 Larger meeting rooms are designed to support various adult learning programs, such as digital photography and sign language. European libraries have long been a source of creativity in library design. 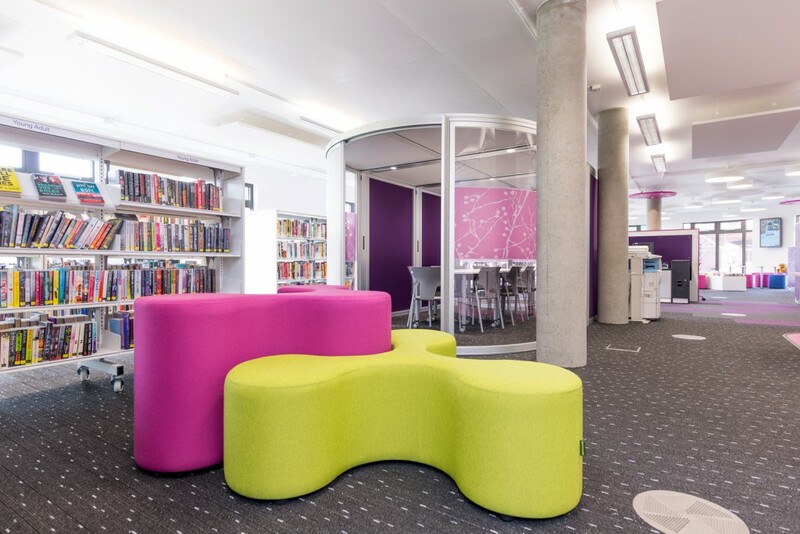 As you can see from the photos in this Library Insights, The Forum is an on-trend library space that can certainly be an inspiration to all of us who influence library design and architecture.